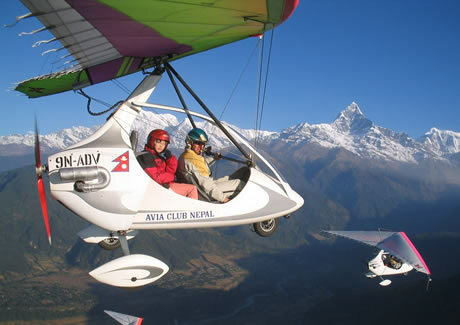 Experience a “bird eye” flying over Pokhara and viewing the Himalayas such as Annapurna. This flight takes you over the city of Pokhara, Fewa Lake, Sarankot Hill, Over the Peace Stupa and the scenic south side of Pokhara Valley. The flight offers a panaromic view of entire Annapurna Range with views of Dhaulagiri and Himchuli in the distance, weather permitting. Maximum altitude is 5000 feet. 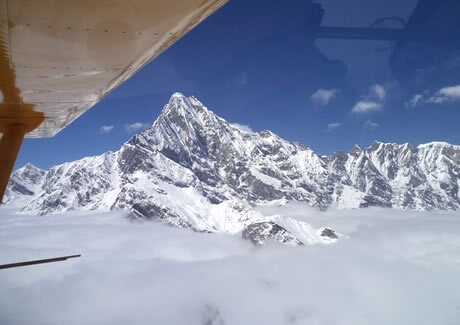 This is by far the most popular flight which offers half an hour of soaring up over the clouds to view Machapuchre, the stunning 6,993 m. peak with twin summit that looks like a fish tail. This flight offers great photography of Fewa Lake, the forested midhills and the high mountains. For a longer, more leisurely look at the mountains up close, this is the flight for you. This flight takes you so close to the mountains you feel like you can touch the snows. Flying at 4000 m at 90 Km/hr, you get to see and zoom in on four of the world’s nine hightest mountains that are in Nepal: Annapurna I, Annapurna II, Dhaulagiri and Manaslu. This is not just a good trekking substitiude it is also enjoyable way for trekkers to go up in the air to retrace the steps they look only a fewdays previously on the way to Annapurna Base camp. This flight doesn’t look at the mountains from below, but flies into the narrow valleys up to the southern slopes of Annapurna. Flying at 4000 m at speeds of upto 130 km/hr in the Aeroprakt, you get the most memorable mountain sightseeing flight anywhere in the world. ※The prices mentioned are subject to the airfares as of 16th March 2016. Airfares may be revised. Please confirm on it when you apply. ※Please understand the flight is influenced by weather conditions on the scheduled days. Contact us by mail or by telephone. Could you please inform us the departure day, the number of people and names (same as the names registered on the passports in alphabet), car services needed or not, (if you want a car service, the name of hotel you stay in). After your reservation is completed, you will pay the amount. Then, the air tickets will be issued and a confirmation letter of air ticket reservation will be mailed. ※ Transfer to and from the Pokhara airport, and Pokhara airport tax are included to the price shown above. ※ The person whose weight is 100 kg and more are not allowed to board in the ultra-light plane. ※ The person who are 18 year old and younger are required to show (submit) the signature of parents or guarantor. ※ You will be in the airport 30 minutes before the scheduled departure time, to listen the explanation made by staff of Avia Club Nepal, and to write down you signature on the agreement for the exemption articles (clauses). ※The personal goods you are allowed to bring in the plane are minimum such as camera. The large luggage is deposited in the office at the airport. Also, please take a preventive measure a strap is tied to a camera or a video camera. ※A flight of ultra-light plane may delay the departure time due to the weather conditions, the restrictions made by the airport or the control tower. Also, in case a pilot may judge a flight cancellation because of security and safety, the charge of flight fare is refunded after the handling charge US$15 is deducted. ※On the ultra-light plane, an insurance company may exclude it from the insurance coverage or may ask to pay the additional insurance charge separately. Please check and confirm the overseas policy you have bought. Cancellation on the flight day: No refund. 100% of paid amount is a cancellation charge. ※The cancellation policy would be changed by an airline company without a notice. Please confirm the latest cancellation policy when you apply. 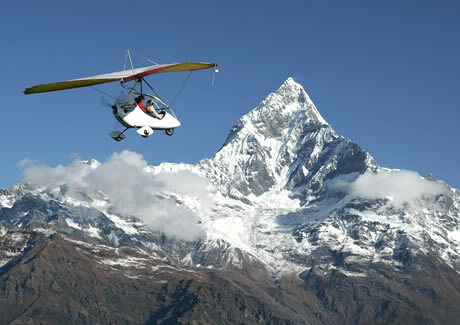 The popular activity is Ultra-Light Plane that is operated from the airport of Pokhara. Experience a “bird eye” from the townscape in Pokhara in altitude 800m to the mountains of Annapurna in altitude ranging from 7,000m to 8,000m. This flight is conducted by a small plane for two people; a pilot and a customer. The plane is designed for 2 people enjoying a flight easily and the total plane weight is 600 kg. There are 4 flight courses; 15 minute trial flight, 30 minute flight, 60 minute flight to view the scenery of Annapurna mountain ranges thoroughly, and 90 minute flight to view the gorgeous Himalayas as much as you do. The flight is operated by a plane of either open cabin model or closed cabin model (for high altitude flight). 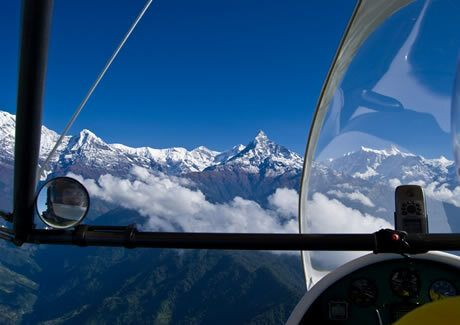 Please appreciate the splendid scenery of Pokhara and Annapurna from the high sky.